There are fresh peaches everywhere lately and it makes me so happy. Inevitably, I buy too many though which then forces me to make desserts like this one. 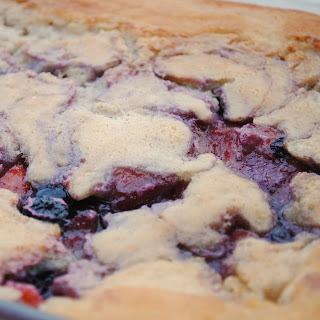 I mean I couldn't let the peaches go to waste - and I had some blueberries to use up too. I had to do it. And I'm so glad that I did... it was absolutely delicious. I love fruit desserts - cobblers, crisps, pie a la mode, etc - warm fruit and sugar topped with some form of whipped cream or ice cream is perfection for me. The really cool part about this recipe is watching it bake, when you assemble the cobbler, the batter goes in the bottom of the pan and you spoon the fruit over the top but as it bakes, the batter rises to the top and the fruit forms delicious rivers of syrupy goodness over the top. 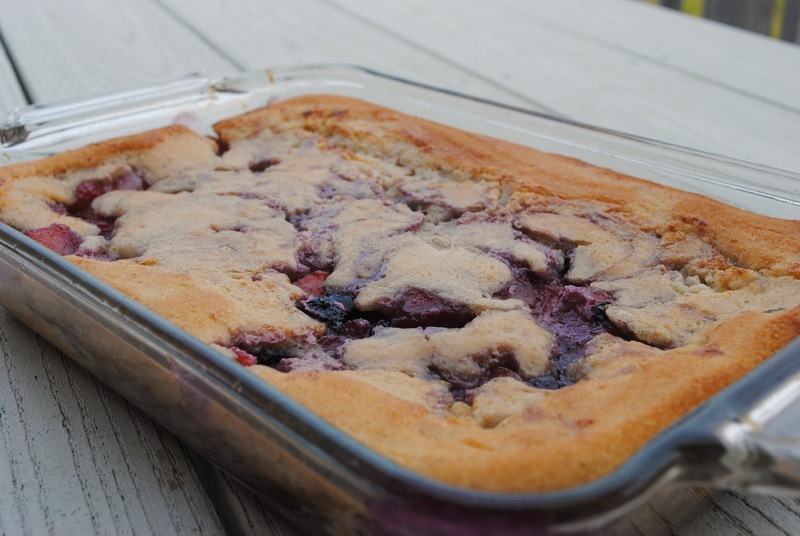 In a saucepan, combine peaches, blueberries, water, vanilla extract, and 1 cup sugar. Stir gently to combine and bring to a boil, simmer for approximately 10 minutes and remove from heat. Preheat oven to 350 degrees. Add butter to a 9x13 pan or 3 qt baking dish and place in the oven until melted. Meanwhile, combine remaining sugar, flour, baking powder, salt, cinnamon, and milk in a small mixing bowl and whisk until well combined and mostly smooth. Pour batter over the melted butter but do not stir. 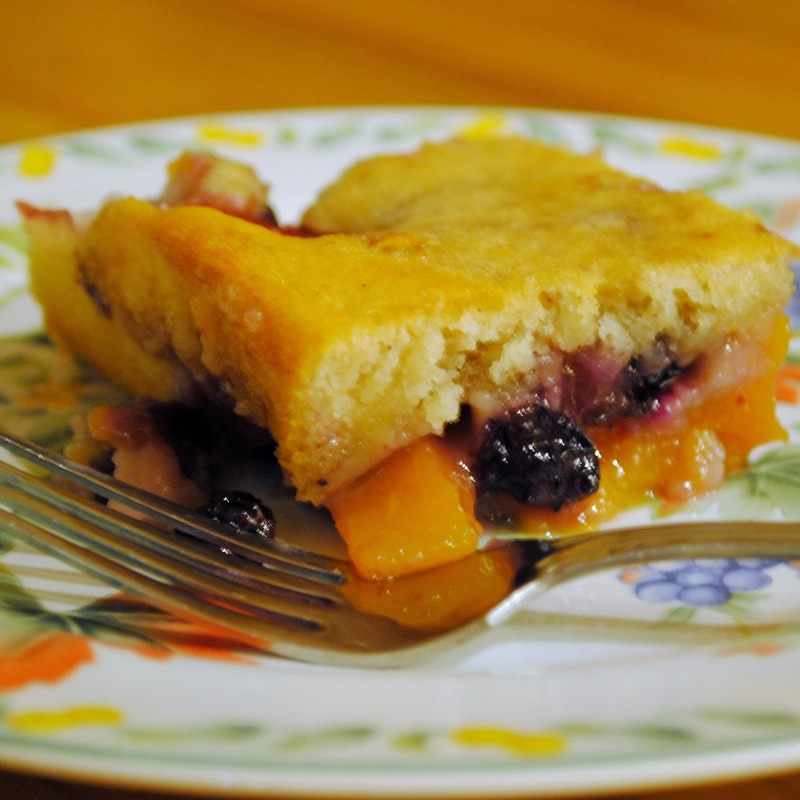 Gently spoon fruit over the batter and pour in any syrup. Bake 30-45 minutes until golden brown. The batter will rise to the top during baking forming the traditional cobbler crust over the fruit. Top with vanilla ice cream or whipped cream if desired when serving.